Summary: CT and MR imaging studies were performed in a 3-year-old boy with infantile fibromatosis arising from the infratemporal fossa and extending into the middle cranial fossa. On CT scans, the lesion was hyperattenuating (44–49 Hounsfield units [HU]), enhancing significantly after application of contrast material (63–66 HU). The MR images showed a multilobulated lesion of heterogeneous signal intensity. The tumor was markedly hypointense on T2-weighted images and slightly hypointense on T1-weighted images relative to brain tissue, iso- or slightly hyperintense relative to tongue muscle on both T2- and T1-weighted images, and enhanced strongly after administration of gadopentetate dimeglumine. Infantile fibromatosis is the childhood counterpart of musculoaponeurotic fibromatosis (abdominal or extraabdominal desmoid tumor) in adults (1, 2). This locally infiltrative process is characterized by fibroblastic proliferation with a wide histomorphologic range (3). Both treatment and diagnosis are often controversial (4). It usually arises in the skeletal muscle or in the adjacent fascia or periosteum. Head and neck involvement represents about one third of all manifestations (5); however, to our knowledge, intracranial involvement has not been described in the literature to date. In this report we describe such a case and discuss the role of MR imaging and CT in the diagnosis of this lesion. A 3-year-old boy presented with a 2-month history of decreased movability of the temporomandibular joint with impairment of speech and swallowing. Asymmetry of the face had already been observed for about 1 year. He had a history of herpes keratitis of the right eye and convergent strabismus, which had been treated. The boy had been delivered by cesarean section owing to intrauterine fetal distress and cord prolapse. He has a healthy 6-year-old brother. On physical examination, a firm, nontender tumor of about 5 × 3 × 3 cm was found at the angle of the right mandible without palpable margins in the region of the infratemporal fossa. Neurologic examination revealed a weakness of the right abducent nerve. CT showed a homogeneous, hyperattenuating (40–49 HU), contrast-enhancing (63–66 HU) tumor of the right infratemporal fossa, with continuous extension through the foramen ovale and lacerum into the middle cranial fossa. We found a hook-shaped bony deformation but no destruction of the right mandible. There was no evidence of calcification, cystic transformation, necrosis, or associated cervical adenopathy. MR imaging at 1.5 T showed a large multilobulated soft-tissue mass extending from the infratemporal and pterygopalatinal fossa through the oval foramen into the middle cranial fossa and the right prepontine cistern. The tumor reached the cavernous sinus and displaced adjacent brain structures. There was no evidence of brain infiltration or reactive brain edema. Signal intensity was more heterogenic than on CT scans. On T1-weighted (550/13 [TR/TE]) images, tumor signal was iso- to slightly hyperintense relative to tongue muscle and intermediate between muscle and fat on T2-weighted (2700/90) images (Fig 1). Compared with brain parenchyma, the tumor was markedly hypointense on T2-weighted images and slightly hypointense on T1-weighted images. Strong enhancement was noted after administration of gadopentetate dimeglumine. An incisional biopsy was performed in the infratemporal fossa, and histologic findings were controversial owing to alterations in the surrounding muscle. Results of a second biopsy from the same region were consistent with the diagnosis of infantile fibromatosis. Because of inoperability and lack of hormone receptors, chemotherapy (ifosfamide, vincristine, actinomycin D) was instituted, with subsequent reduction in tumor size. Chemotherapy will continue until definitive surgical resection becomes feasible or no further tumor reduction is observed. Infantile fibromatosis with intracranial manifestation in a 3-year-old boy. A–D, Axial T2-weighted images (2700/20/6 [TR/TE/excitations]) and sagittal T1-weighted images (550/17/2) with and without contrast enhancement depict a tumor in the infratemporal and pterygopalatinal fossa extending through the oval foramen into the middle cranial fossa and the right prepontine cistern. The signal intensity is more heterogenic as compared with CT scans. On the T2-weighted images (A, B) the signal intensity was intermediate between muscle and fat and the tumor was markedly hypointense relative to brain parenchyma. On the unenhanced T1-weighted image (C) the tumor was iso- to slightly hyperintense relative to muscle but slightly hypointense relative to brain parenchyma and strongly enhanced with gadopentetate dimeglumine (D). Contrast enhancement was particularly pronounced intracranially (arrow). Proliferative disorders of fibrous tissue express a wide spectrum of histologic and morphologic variation in both infants and adults, with hypertrophic scar formation at one end and malignant fibrosarcoma at the other end of the spectrum (1, 2, 5). The heterogenic group of fibromatoses is part of this spectrum, in proximity to fibrosarcomas. These fibromatoses are locally invasive and often recur after excision, but do not metastasize. Histologically, the tumors are characterized by proliferating fibroblasts with little mitotic activity. They are usually surrounded by more or less dense bundles of collagenous matrix (1, 6, 7). Different subtypes of fibromatoses in children have been described (5). The main features of fibrous hamartomas of infancy consist mostly of more or less differentiated fibrous and fatty tissue and are often found in the axillar region. Infantile digital fibromatosis is characterized by small nodules on fingers and toes of children, and have the histologic hallmarks of cells with eosinophilic intracytoplasmic bodies. Myofibromatosis is a typically benign, self-limiting cell proliferation with a biphasic architecture of smooth muscle cells surrounded by undifferentiated cells. A poorly defined proliferation of fibrous tissue originating from the sternocleidomastoid muscle in very young children is called fibromatosis colli. Infantile fibromatosis is a rare tumor that may originate from different soft-tissue structures throughout the entire body. Most commonly affected are muscles of the head and neck region followed by muscles of the upper extremities. As in our patients, young children are usually affected during the first or second year of life; prevalence is slightly higher in boys than in girls (5, 8). Infantile fibromatosis generally presents as a painless swelling that has been observed for several months, often fixed to the underlying muscle or bone but not to the skin. As the unencapsulated lesion grows, it infiltrates adjacent structures such as muscle, vessel, and bone and may occasionally occupy a large part of the soft tissue of the head and neck (4, 5, 7). The cause of tumor growth is still unknown. Trauma has been suggested to play a role in its histogenesis; however, a relationship has yet to be proved. Interestingly, there is a history of complicated delivery in our patient. On CT examination in our case, the tumor displayed attenuation characteristics previously described for extraabdominal desmoid tumors (9), the adult counterpart of infantile fibromatosis. The lesion appeared homogeneous and slightly hyperattenuating relative to surrounding tissue on noncontrast scans and markedly hyperattenuating after administration of contrast material. On MR images, most soft-tissue lesions show a high signal intensity equal to or greater than that of fat on T2-weighted MR images (6, 10). Recent studies underline the correlation between signal intensity on T2-weighted images and the histologic composition of such lesions; increased cellularity and decreased collagen bands correlate with a higher signal intensity (6, 10, 11). Thus, fibromatoses possess typical MR features. The lesions are isointense to slightly hyperintense on T1-weighted images, intermediate between muscle and fat on T2-weighted images, and enhance after administration of contrast agent (9, 10). These findings were evident in our patient. Nonetheless, these changes are not specific, and biopsy is always necessary to distinguish infantile fibromatosis from other soft-tissue tumors, such as infantile fibrosarcoma or rhabdomyosarcoma. But MR imaging may help to identify the more benign nature of fibromatoses. The lack of peritumoral soft-tissue edema and the presence of areas with very low signal intensity on T2-weighted images suggest a slow-growing and more benign proliferative soft-tissue disorder. Interestingly, the contrast enhancement was more conspicuous within the markedly hypointense intracranial part of the tumor. In addition to being useful for tissue characterization, MR imaging was the most suitable imaging method for delineating total extension of the tumor and for clearly suggesting its inoperability in our case. As the tumor did not express hormone receptors (12), chemotherapy was initiated and tumor size was subsequently reduced. 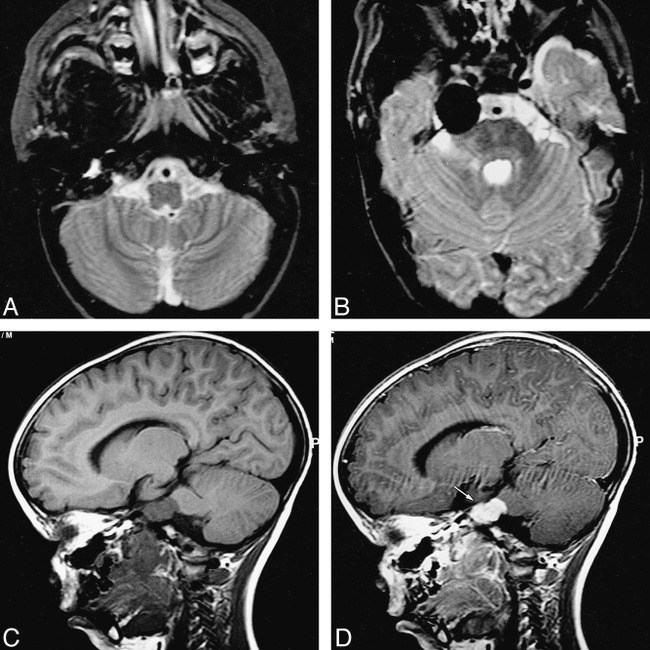 To our knowledge, this report documents the first case of juvenile fibromatosis with intracranial growth and displacement of brain structures. Infantile fibromatosis should be considered in the differential diagnosis of any soft-tissue mass of the head and neck in young children, particularly when characteristic MR findings suggest a benign lesion. CT may help to identify bony destruction. MR imaging provides a detailed anatomic representation for initial staging, and, with its lack of ionizing radiation, is the method best suited for long-term follow-up examination of these young patients. 1 Address reprint requests to Dr. med. S. Flacke, Department of Radiology, University of Bonn, Sigmund-Freud-Straße 25, D-53105 Bonn, Germany.